Your delicate, thread-thin post-holiday nerves are going to snap when you see this, fellow Scrubs devotees. No, not because of the seemingly endless department store line you're waiting on to return all of your ill-fitting and hideous Christmas sweaters (sorry, Grandma) while missing an all-day self-imposed Scrubs marathon. You have all the seasons on DVD, and honestly, you can do that any day. It's because JD, Turk, and Dr. Cox, or as they're called in the real world, Zach Braff, Donald Faison, and John C. McGinley, reunited last night and we were given an exclusive and adorable picture courtesy of Braff via his Instagram account. And, as you most likely know, even the things that make our hearts do a perfect 10 double axel can break us after such an arduous and emotionally taxing week among blood relatives. There are a few different ways to react to such a jarring and yet fulfilling revelation such as this. For instance, tear shedding, a standing ovation, or, perhaps maybe just a demure and reserved double tap. Or, like a loyal Scrubs fan, a true reaction the melodramatic and ironic Scrubs way. After all, seeing JD and Dr. Cox nuzzle faces next to a bright eyed Turk evokes something deep within us that only Scrubs GIFs can really articulate. So, here's the variety of reactions you may or may not (or definitely) had to seeing the Scrubs reunion pic. What does this mean?! Are they going to live together in a commune and reenact old Scrubs episodes for all eternity? All the time. It hurts all the time. To a JD/Turk Braff/Fasion friendship we all aspire. Natural disasters, wars, Van Dutch trucker hats. 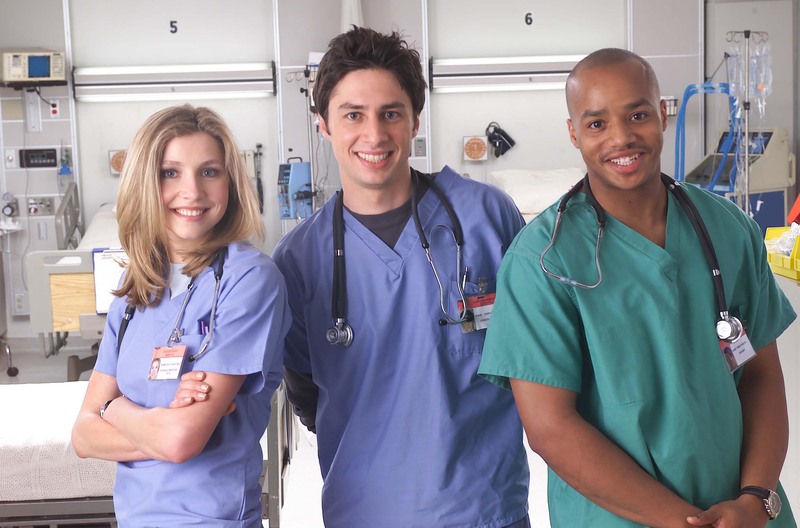 Scrubs was there for us through it all. Hey, it's worth a shot. But maybe not the restraining order.